Samantha Rushing is this year’s President’s Medallion Award winner from Berkeley City College. Rushing knew early that she wanted to be an English teacher. Growing up just outside Stockton, she wished her teachers were more inspiring. At age 16, she decided that teaching would be her professional goal and, although there were a few bumps along the road, that goal has never waivered. At Berkeley City College, Rushing maintained a 3.92 GPA. She credits the EOPS and CalWORKs programs for helping her realize her goal. And it helped that BCC teachers, staff and administrators genuinely care about students and do everything in their power to help them stay on the right path, Rushing says. The future teacher was hired as an English tutor her first semester at BCC and has helped dozens of students since. She has also served as the Secretary of the Associated Students at Berkeley City College. A single parent of a four-year-old girl, Rushing was accepted to UC Santa Cruz, Sacramento State University and California State University, East Bay, and she is waiting to hear from UC Davis and UC Berkeley. With the start of the 2014 Olympic games in Sochi, Russia, it is nice to remember that the Peralta Colleges had their own Olympian. 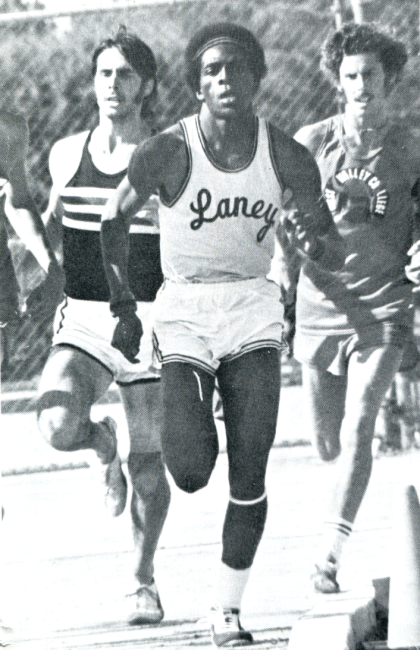 In 1974, Laney student James Robinson was the second best half mile runner in the United States. Robinson also ran for McClymonds High School in Oakland and University of California at Berkeley. He competed in the 1976 Summer Olympics in Montreal, Canada. Ericka Huggins is an educator, former Black Panther Party member, political prisoner, human rights activist and poet. For the past 30 years Ericka has lectured throughout the United States on the restoration of human rights, whole child education, and, the role of spiritual practice in sustaining activism and promoting social change. Ericka is currently a professor of Sociology at Laney College and Berkeley City College. She is also a professor in the Women’s Studies department at California State University-East Bay. She teaches relaxation and resiliency skills in elementary and secondary schools as well as juvenile and adult prisons and jails.